The Recast 2.5 release is the first release that merges the free and enterprise versions into a single installer. Previously Recast RCT Free and Recast RCT Enterprise were separate downloads with independent code bases. Combining them allows us to more efficiently fix bugs and add features to both sets of tools. To accommodate this, there are significant changes to both Recast RCT Free and Recast RCT Enterprise. View the Recast 2.5 Release Webinar from Sept 12th for an in depth walk through of these updates and new features. Up until this point, the Recast RCT Enterprise tools have been based on a client / server architecture, while Recast RCT Free ran everything locally. With the 2.5 release, Recast RCT Enterprise has the option of either running locally or through a Recast Server. The Recast RCT Free tools will still run locally as they do today. It’s worth noting that “Run Locally” means something slightly different in this version than it did in Recast RCT Free 2.4. We’re still using a client / server architecture even when running locally, the difference is that the server is hosted inside of a Right Click Tools Desktop.exe process on your computer. If running locally, you may see a Right Click Tools Desktop.exe process running even when you have no Recast tools open. LAPS tool to show local administrator password information on devices. This works from the desktop tools as well as Recast Mobile. Schedule Wake on LAN. 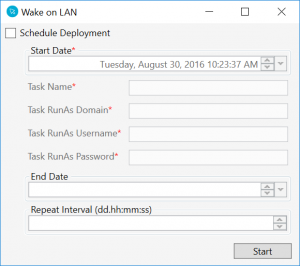 You can now schedule Wake on LAN packets to be sent at a specific time from Recast RCT Enterprise. I can’t seem to find a download link for Recast 2.5 Free. Can you help me with this? Nevermind, I found out, that 2.5 isn’t released yet. You should have received an email today with the correct download. I attended your webinar for 2.5 release yesterday. Is 2.5 available for download yet? I tried to download the tools but it appears to still be 2.4 release. You should have received an email today with all of the information. I attended the webinar and keep looking for 2.5, nothing yet. Regarding the Recast RCT free version, what is the purpose of the System Information tab within the “Configure Recast RCT” applet? If you add columns, where do they appear, if at all in the free version? The system information tab lets you select which columns show up on the Device Collection System Information tool. Thank you, I see it now on a device collection.